Lately, I’ve been doing a lot of summer traveling for weddings and to visit family and friends. With travel, comes lots of photo taking. 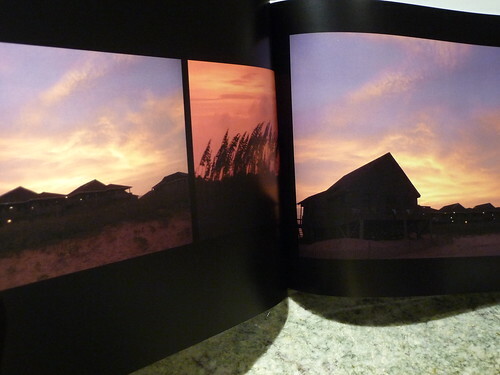 Not that you have to go on a trip to take photos, but travel photo books are my favorite types of photo books to do. So, I suppose you could say that I have to travel so I can take more photos, that go into the photo books, that become the basis for my reviews. Such a personal sacrifice – but you’re worth it! So, you notice that because I used the FREE book promo that ran through August of this year and my ($25 for $100) Groupon, I was able to save 82% off the cost of this 52-page book. With shipping it only cost me $18.17 after applying both discounts. With the frequent deals that Picaboo runs on photo books, you shouldn’t have any trouble finding the right opportunity to maximize your Groupon. For an in-depth look at Picaboo’s software, see my earlier review on the Picaboo Madison. Since the software and process of designing the books are the same, I won’t cover that again in this post, but will go straight to a review of the Classic Custom Hardcover. Keep in mind that while the same software is used to create all the books in Picaboo’s product line, the book styles and paper type are pretty varied. 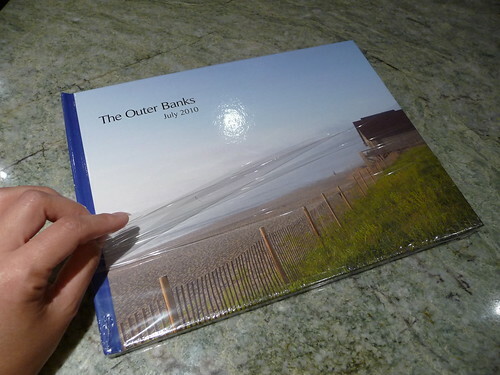 The book comes shrink-wrapped and packaged in a white cardboard box. Standard shipping appears to be by 2-day Fed Ex from Palo Alto, California. Considering that there were probably lots of folks taking advantage of the free book promo, book production only took one week and got to my door two days later, so good marks for speedy delivery. 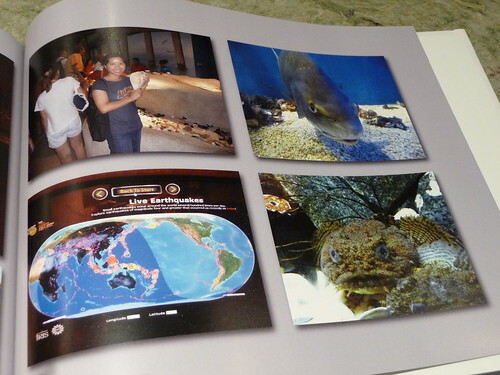 The cover features a glossy laminated photo of your choice with your option of adding a title. The spine may be customized with a photo or plain background of your choice, but you can’t customize it with text using the Picaboo software. You may be wondering what I did here to get a title on my spine if you’re not supposed to be able to do that. Well, I like to think outside the box and I don’t like limitations! Admittedly it came out a bit blurry, but I was rushing and didn’t take the time to perfect it. But you get the idea! 6) Use the photo tools to center it properly. You may have to play around with sizing a few times to get it to the right size, but don’t forget to turn on the trim guides – you wouldn’t want to have your title cut off by accident. Err on the side of smaller. If I could do mine over, I would make the text smaller as it just nearly started to creep over to the top of the book, and would probably choose a simpler font for the text. Keep in mind that you can use this technique for any photo company that allows you to put your own image on the spine, but doesn’t allow for text (like Shutterfly for instance) though obviously it would be a lot easier and better if the software were upgraded to allow this. Disappointingly my back cover didn’t print out correctly, there was a white band on the left side for some reason. When I double-checked the preview my photo completely covered the back page, so I don’t know why it printed that way. I’ve made two classic custom books with Picaboo and the other one printed out really nicely. 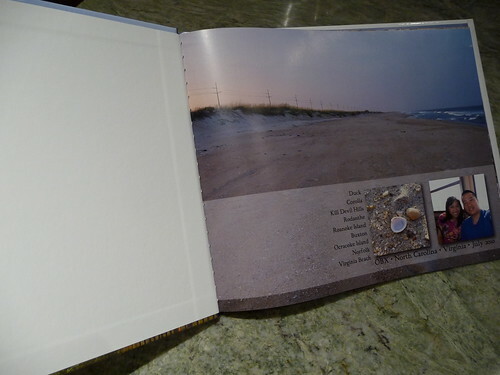 Opening the book takes you to the first page of your book layout. 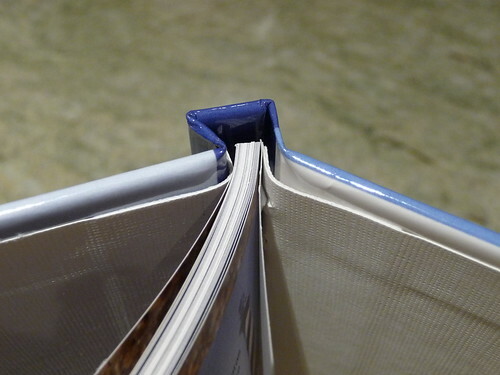 You can see the stitching that holds together the book. I would prefer to see an overlay sheet in the front like the one that is in the rear of the book to give it a more finished look. The semi-translucent overlay in the back features the Picaboo logo. Overall the print quality is good, but my blues weren’t as bright as they should be, while my reds were redder. 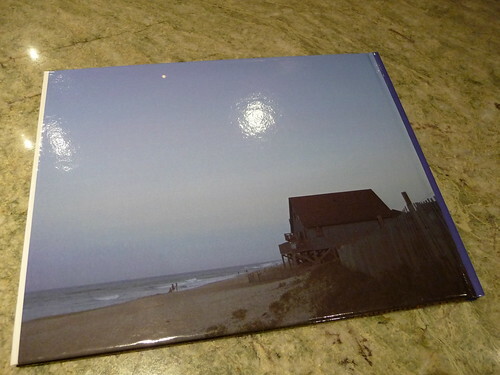 So as it turns out, I like the way my sunset photos came out, but my blue skies weren’t as vibrant as they should be (as you can tell from the cover). 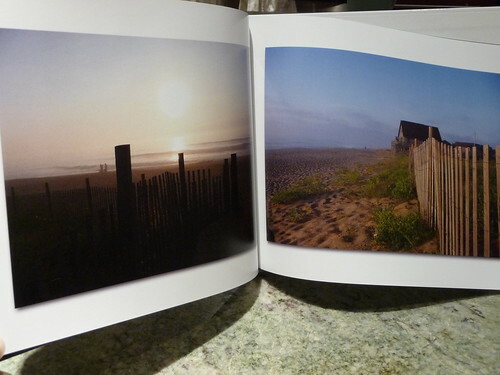 It can be hard for a printed photo book to equal the luminosity of the computer screen, so it is a good idea to err on the side of making your photos brighter and more vivid to start with. See this post for more tips on editing your photos with Photoshop or how to edit your photos using iPhoto. 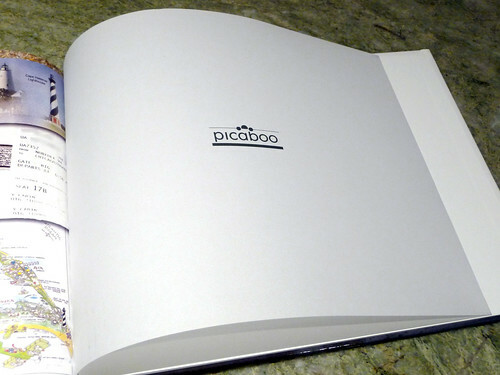 Did you get your free Picaboo custom cover hardcover book? Share your thoughts on it! If you haven’t tried Picaboo, there’s no better time to check out the FREE BOOK deal below! Hi, I came across your blog when I was looking for reviews on Picaboo. Thanks so much for your in depth review. It’s been very helpful. What I’d love to know is how you got that last photo in your post – the one w/ the maps and tickets? 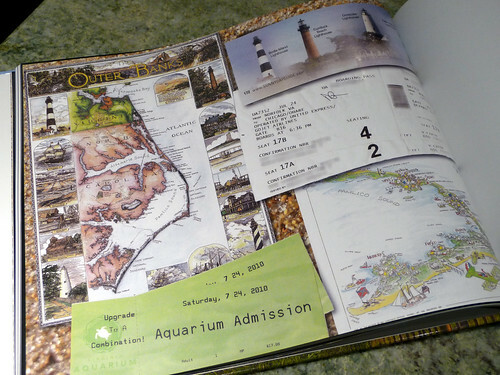 I’ve been doing a lot of traveling and am not a scrapbooker, but I would love to be able to save some of my entry stubs or maps of the towns and have them in my book. Any thoughts or tips you might have are greatly appreciated. 4) Drag and drop into a page with a full page bleed (a single photo container that covers a full page). Done! Keep an eye out for the more detailed version of this to come. A good way to keep up with my posts is through my Facebook Fan Page – should be a button to the right to “like”! I took advantage of this deal for a photobook of my vacay to Mexico with my hubby. It turned out well I must say, the colors were pretty true to my original image and overall I thought the image quality was superior to shutterfly (the only other photobook company I’ve tried [althogh shutterfly’s pages felt thicker]) I’m hoping to try the Madison lay flat book next for a honeymoon photobook! Photobookgirl – LOVE your blog! This site is beyond helpful! Hi Brandy – thanks for your comment. I don’t have any immediate plans to try out Picaboo’s extra large size – just because I’ve been trying out new companies to write more reviews. I know that I remember reading on my site’s Facebook page that one of the fans had printed a book in the new size. If I can find the comment, I may be able to ask her to give her opinion on it. The Madison and the Classic books are completely different style wise so I can see why you’re having a hard time deciding. I think the Madison is really nice for special occasions and stands out because of its unique pearlescent finish and thick pages. Plus the leather trim and presentation box. So, I don’t know if that helps, but I really liked my Madison book since it was unique. I tend to like things that are different though in many things (food, design, people etc…) so I may be biased in that sense! ha ha… Are you a fan on the FB page? I’ll ask that reader for her opinion, so it may show up there. I spoke with the support at Picaboo, and I guess the extra large uses the same 100lb paper as the smaller versions. It’s dissapointing since I’m a fan of the large custom covers. Guess I’ll have to go with Capecod, because I definitely want heavier paper. Brandy, I was thinking about what you had written that Picaboo told you that the 100lb. paper in the 11×14 is the same as the 100lb. in the smaller size, but that’s not what I was told by Picaboo. If you skim through my post, I talk about paper weight in the new size. To summarize, although both weights are 100lb. the smaller one is gloss stock, while the other is cover stock. Cover stock is considerably thicker than the regular stock, so I think customer service may have seen “100lb.” and didn’t notice the difference in the paper type. I saw that in your post, but their site doesn’t differentiate paper type between the extra large and others so I double checked with them via the chat. I did’t think about him possibly only glancing at the weight though. That would make my day if he was wrong! haha I’ll have to give them a call. Hi, I just recieved a Classic Custom photobook I made from a trip to Alaska this summer and I had a groupon so I tried the new lay-flat page option for the first time. I have used Picaboo several times and this was the first time I was greatly disappointed in the product. The cover photo was very dark, the same photo is inside the book and is ok. Many of the blues are dull (there are a lot of blues in Alaska photos!) There was a white line at the bottom of some of the pages too, even the cover came dented. I have contacted customer support and sent them photos, I even compared 4×6 prints from Snapfish to the same photos in the book and many of them are muddy and noisy. BTW they were taken with an 18 megapixel dslr and tweaked in Photoshop for maximum color and exposure. Have you heard many other complaints about their quality? Hopefully they will send a new copy that is much better, but I have many hours invested in designing the book and will probably not use them again unless there is a huge difference in the reprint. The only other websites I have used are Shutterfly, which I feel is painfully slow, and Snapfish, which is too limited. What company do you recommend for best quality for basic books for travel photos? I hope you get a better result if they reprint for you. Maybe it was just a bad run? Especially since you’ve had good results before. Other than the companies you mentioned, I’ve done travel books with MyPublisher and Photobook America. I have a page on travel photo books. If you scroll to the bottom, you’ll see a list of posts of all the travel photo books I’ve done. Hope that helps! I finally got around to placing all my photo books on a shelf in my office. Now that I can see them all together, I noticed some significant difference in the three Picaboo 12″ x 12″ books. The binding area in not tight. What I mean by that is that the cover (and I got the image wrap glossy color cover) is puffy near the spine unlike the other books I own that are very tight. I wish I could show you guys a photo of what I am talking about. When I run my finger down the front of the book where the cover bends, it makes a sound like the book has come (or has never been) adhered there. The books I have from Blurb are the best and the cover feels very professionally bound. 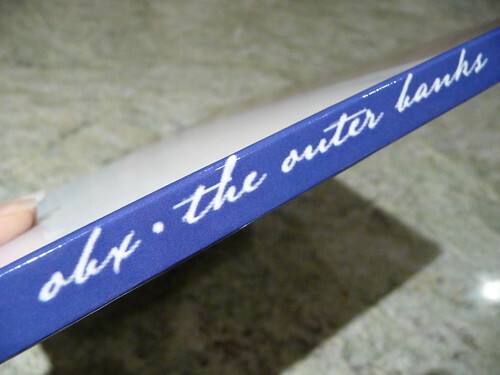 The Shutterfly ones are holding up really well too and I would rate them second on the spine binding. The Inkubook ones are a close third. No problems with my Mixbook or Photobook America (can you see how band loyal I am?) But, the Picaboo ones are puffy and don’t feel as professional. Does this hinder my enjoyment of the book? No! But, I hope it is not an indication of the lifespan of the book. Anyone else experience this puffy cover near the spine? Thanks! Hi Mike, Sorry for the late reply – i looked at my Picaboo books and yours definitely looks warped. Mine don’t do that. There may be a slight bump on one area of the back spine of one of my books, but not anything close to what you’re showing. I think it was a bad run and they should reprint them for you. Hope they’re working on that? If you don’t get a response soon, or having problems otherwise, I’d post for help on their Facebook page. That has usually gotten me the quickest response for any company I want to get a hold of. Hi, Picaboo did respond and told me that the way the book looked was not normal, but that I should have reported it in the first 30 days. I told them that it wasn’t as pronounced in the first 30 days as it is today and that it had gotten a lot worse. I also told them that I hope the binding on my photo books last longer than 6 months. They did agree to print both books over again after I send them some more pictures. I Will follow up on how those look. You know, Shutterfly was my first photo book company and I have been shopping around and ordering from nearly everyone out there. I have to say, that while I have had hit and misses, my Shutterfly books are still consistently the best. But, that won’t deter me from ordering from others. I have my first My Publisher book coming this week! Take care!